For growing solo and small firms, deciding when to use billable resources to hire new employees can be a challenge. 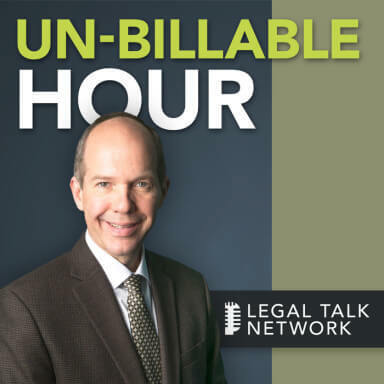 In this episode of The Un-Billable Hour, host Christopher Anderson talks to Greg Garman about when firms should hire freelance lawyers to help them fill in the gaps. They discuss the benefits and functions of freelance lawyers, like providing different levels of expertise and freeing up a firm’s time. Greg Garman is the CEO of Lawclerk and a partner at Garman Turner Gordon. Christopher Anderson: Welcome Un-Billable Hour listeners. Before we get started, I want to thank our new sponsor Lawclerk; Lawclerk, where attorneys hire freelance lawyers. There are no sign up or monthly fees. Only pay the flat fee price you set. Increase your profits, not your overhead. Learn more at HYPERLINK “www.lawclerk.legal” www.lawclerk.legal. And now, on to The Un-Billable Hour. Today’s episode is about people and our title is Filling in the Gaps. My guest is Greg Garman, Co-Founder and CEO of Lawclerk and I of course am your host Christopher Anderson. I am an attorney with a singular passion for helping other lawyers be more successful with their law firm businesses. I am dedicated to helping lawyers across the country to achieve success as they define it. In The Un-Billable Hour each month we explore an area important to growing revenues, giving you back more of your time and/or improving your professional satisfaction in one of the key areas of your business. I start with the fundamental premise that a law firm business exists primarily to provide for the financial, personal and professional needs of you, its owner. In this program I have a chance to speak to you as I do in presentations across the country about what it takes to build and operate your law firm like the business that it is. I have a chance to introduce you to a new guest each month to talk about how to make that business work for you, instead of the other way around. Before we get started I do want to say a thank you to our sponsors, Answer1, Solo Practice University and Scorpion. Answer1 is a leading virtual receptionist and answering services provider for lawyers. You can find out more by giving them a call at 800-answer1, or online at HYPERLINK “http://www.answer1.com” www.answer1.com. That’s HYPERLINK “http://www.answer1.com” www.answer1.com. And again, today’s episode of The Un-Billable Hour is Filling in the Gaps. One of the topics I cover is people and you may remember from last month that I said people run your systems and systems run the business. Well, deciding when you can add people and the pain around billable resources, adding them too late, too early are the bane of many growing small law firms. But finding good, reliable, quality contract help can be time-consuming, inconsistent and risky. My guest today is Greg Garman. Greg is one of the Co-Founders and the CEO of Lawclerk and he knows this pain. He has looked long and hard at the opportunities and risks of temporary contract and freelance professionals in the legal industry and so let’s find out some of what he has learned. So first of all, Greg, welcome to The Un-Billable Hour. Greg Garman: Chris, thanks for having me. Christopher Anderson: You are very, very welcome. As always, it’s almost tradition in my show, my introduction of you was terrible. So please, if you don’t mind, just introduce yourself to the listeners, about your business and what you are bringing to law firms across the country. Greg Garman: Sure. So I was a practicing lawyer for 20 years and I was the managing partner of a regional law firm when the idea of Lawclerk came to me and my Co-Founders. Lawclerk is a marketplace that’s primarily designed for solo and small firms to allow them to hire freelance lawyers to fill in the gaps that they need, whether it be an extension of their core practice to provide more hands to get the work done or because a client comes through the door who needs something outside of their core skill set. Those are the primary functions that the customers are using our marketplace for today. Christopher Anderson: So I think it’s really cool to — very important to distinguish the two things, because I think a lot of lawyers think about it, as contract lawyers, I don’t want to hire an associate yet so I am just going to augment what we do, but you added in there like, well, how about augmenting what we don’t do, so that could be adding a different level of expertise as well as outside area of expertise. Greg Garman: Yeah. In this world clients are evermore sophisticated and they are always looking for a lawyer with a skill set to get their particular job done, and while they often have a particular lawyer that they go to as their core lawyer, clients are looking for somebody with specialization, whether it be in litigation or tax or you name it. And so Lawclerk does that and that’s what we have experienced is that some lawyers are simply so busy that they need to hire additional help for their core practice. They may not have enough work to keep a full-time associate busy, and that’s an important function; however, we are seeing equally as many people using the marketplace who a good client comes to the door and says I need a lease. I mean that’s not their core practice so they farm that work out to competent skilled subject matter experts who they hire only when they need them to keep overhead down and keep those clients happy. Christopher Anderson: Yeah, which is great, and I think one of the things — I am an attorney too and one of the things that when we think about contract lawyers, I think we are often thinking of less experienced, less skilled, but what you are really bringing into the conversation here is that the contract lawyers could be more skilled, more experienced than the lawyer hiring them. Greg Garman: So the freelance lawyers that we have in our marketplace range from obviously young lawyers, who are recent law school graduates, who are perfect for easy document reviews, research memo, checking cases to make sure there is still good law. But we have law school professors; we have retired Am Law 100 partners who are still looking to stay in the game and everyone in between. A great number of our freelance lawyers are parents, who after spending seven or eight or ten years in the marketplace decided to raise a family and can’t keep up the tough job and lives that we as full-time lawyers have, so it’s a way for them to hone their skills to put it to use and for everyone to do better at the end of the day. Christopher Anderson: That makes total sense. So let’s just kind of — I think we have kind of walked around it a little bit, but how would you state the business case for using a freelance lawyer, like when should law firms really be considering this? Greg Garman: So small and midsized firms are under incredible pressure. Stating the obvious, the supply and demand curve is moving against us. There are too many lawyers graduating. There are too many lawyers practicing and the cost associated with the access to justice has gotten tighter. So competition is facing against solo and small firms and there’s headwind. Regional firms are starting to reach down into the market to try and take the bread and butter client that solo and small firms are used to and technologies are coming along such as LegalZoom and others that are actually trying to reach up and take our clients away from us. Christopher Anderson: Yeah, it sounds like a big squeeze really. Greg Garman: Yeah. And we have all known that the business model we have been working under for the last 100 years in many ways is strained and some call it broken and we need to find ways to evolve that protect the profit margins for the solo and small firm practitioners, yet allow us to produce a better product for the client at the end of the day. And that’s a real struggle. Christopher Anderson: And clients are really expecting us to be more productive too, right, and they are not tolerating what they might have tolerated before. Greg Garman: We have all seen the statistics of the productivity of solo and small firms in recent years and the amount of time that we are all spending in non-billable or write-down hours is growing. Christopher Anderson: Yeah, which is crazy. Greg Garman: And clients are getting more sophisticated. It used to be — there used to be a day in which clients would allow you to spend some time to learn the subject matter on their dime for the purpose of producing the work product, and I think those days are over. Clients are sophisticated now and they are looking to hire people who don’t have to reinvent the wheel, who know the core issues that they are facing and that’s making it hard for solo and small firms to keep clients happy who are looking to get services beyond the core functions that they have traditionally provided. Christopher Anderson: Yeah. And so as you explain that I mean I am thinking about as a business owner or a small firm owner being one that my client knows has access and can provide me with all these different levels of expertise makes me more valuable. Christopher Anderson: It’s an incredible value-add. Greg Garman: So the concept of freelancing has a number of important benefits to it. One, as we have talked about, you get subject matter expertise on demand when and only when you need it. You can become more profitable because overhead for firms is expensive; associates are expensive, insurance, secretarial staff, conference rooms, all of those things add up at the end of the day and the inability to keep associates full-time employed comes dollar for dollar out of profit, dollar for dollar out of our pocket. Greg Garman: Flexible staffing of cases is one of those issues that goes towards work-life balance. We all have incredibly busy times in our careers in which we are going from trial to trial, closing to closing and then want to take a little bit of time off. The bigger the infrastructure, the bigger the overhead, the bigger the nut that’s billed, the harder it is for us to find that work-life balance. Christopher Anderson: Right, because we are making up the difference ourselves, right, as we are getting squeezed, that extra profitability has got to come — the only place we can find it is an extra hour of our own time. Greg Garman: It is. That’s the trouble with selling your own time. And finally, we can’t ever lose sight of the fact that our goal is to deliver the best product we can to our clients and when you can leverage subject matter expertise of people who day in and day out do one particular function of law, we at the end of the day are producing a better product for our clients. Christopher Anderson: Yeah. I mean, you can even imagine — if you think about it, it’s extended to its natural conclusion. I could imagine selling lots and lots of legal services and contracting for almost all of it with freelancers. Greg Garman: So we have customers who use the platform, who take a will and a trust in, for an example, and maybe they charge $1,500 or $2,000 for that function. It’s something they are comfortable doing, but it’s not something that’s in their core practice and it may take them 10 hours to produce that product. You get an effective hourly rate of $200. If you outsource it to a freelancer with subject matter expertise who can do the same thing in a fraction of the time, you may pay $500 or $750 for the same work product. You spend a couple of hours reviewing that to ensure that it complies with all the requirements imposed upon us as lawyers and dealing with our clients and your effective hourly rate has doubled and sometimes tripled. Christopher Anderson: And I think that’s one of the keys to the freelancing, at least as it’s done with Lawclerk, is that all the work does get reviewed by a lawyer in the firm, so the freelancers aren’t providing legal services directly to the clients. Greg Garman: Right. So the way it works is that there’s a relationship that’s sacred between a client and the attorney that they hire. That attorney is obviously subject to bar rules, to disciplinary action by their local community and they are the ones who are providing the legal services at the end of the day. They are the ones going to court, appearing before tribunals. They are the ones calling opposing counsel. They are the ones interacting with their client. But we have all become comfortable with the concept of paralegals working in the background or law clerks working in the background, first years working in the background. We would never let a first year produce a product or go to court without reviewing by a more seasoned senior attorney. We have taken that accepted business model and we have essentially put it on steroids, because we have taken what used to be paralegal work or first years with a limited skill set and we have turned them into sometimes 10 and 20 year practitioners who have real subject matter expertise in what they are doing and it’s a benefit to everyone. Christopher Anderson: That makes total sense. So I am talking with Greg Garman, the Co-Founder and CEO of Lawclerk. We are talking about the use cases and when law firms might be using freelance lawyers and what a lot of the benefits are and what are the business cases for using them. When we come back from the break, we will be asking Greg about what kind of attorneys are using freelance lawyers and where we are seeing their use and how it’s improving their businesses, but first we will take a word from our sponsors. Advertiser: Is your firm experiencing missed calls, empty voicemail boxes and potential clients you will never hear from again, enter Answer 1, Virtual Receptionists. They are more than just an answering service. Answer 1 is available 24×7. They can even schedule appointments, respond to emails, integrate with Clio, and much more. Answer 1 helps make sure your clients have the experience they deserve. Give them a call at 1-800-answer1 or visit them at HYPERLINK “http://www.answer1.com/podcast” answer1.com/podcast for a special offer. That’s HYPERLINK “http://www.answer1.com/podcast” answer1.com/podcast. Advertiser: Feel like your marketing efforts aren’t getting you the high value cases your firm deserves? For over 15 years Scorpion has helped thousands of law firms just like yours attract new cases and grow their practices. As a Google Premier Partner and winner of Google’s Platform Innovator Award, Scorpion has the right resources and technology to aggressively market your law firm and generate better cases from the Internet. For more information, visit HYPERLINK “http://www.scorpionlegal.com/podcast” scorpionlegal.com/podcast today. Christopher Anderson: And we are back with The Un-Billable Hour. I have been speaking with Greg Garman, the Co-Founder and CEO of Lawclerk. We have been talking about the business case for using freelance lawyers. And we said when we would come back that we would be talking more about what kinds of attorneys are using them and more of how they are impacting their practices. So let’s start with that question. What types of attorneys do you find are in fact using freelance lawyers? Greg Garman: So if we look back the candid answer is everyone. Historically, large firms have hired contract lawyers. They have hired them in bulk to do things such as document reviews, to do diligence for M&A work, and large firms have been comfortable with contract lawyers that they bring on to their staff for a short duration of time. That’s now finding its way into solos and small firms through the use of the terminology of freelance lawyers, which is identical to a contract lawyer. But we forget that of the 1.3 million lawyers in the country, half of them are solo practitioners that are a single man or woman with a shingle and three out of every four practicing lawyers is affiliated with the firm of five or fewer. By definition, there’s only so much that can be covered by those small groups of lawyers or individuals today in a core competency that they know day in and day out. And so just the same way that large law firms have found the use of specialists to do diligence work or document reviews, solos and small firms can do the same thing for a subject matter expertise. Christopher Anderson: Yeah. It’s so funny that you said it because I was on the floor — by the way, we are here at ABA TECHSHOW doing the show today and I was speaking with another lawyer who came and talked to me and I asked him what kind of law they practiced and he said whatever kind my clients want. And I looked at him and I was like — I didn’t want to rip him apart too bad, but I am like you are just not doing a great service to your clients. But then I hadn’t thought about, unless — and he didn’t say he was using freelance lawyers, but that would be a great way to expand what he can do. So yeah, if I am a small firm lawyer, solo lawyer in a small town, I can really offer a lot more if I am willing to take on freelance lawyers with different subject matter expertise. Greg Garman: So we all have the duty of competency to our clients. And in the world that wasn’t so competitive, solos and small firms had the ability to go spend the time to make sure they were up-to-date on each area of law that they were producing a product for. And in a world in which overhead was smaller, in a world that moved slower, in a world in which clients expected candidly less in some ways, you could do that. But as the world has become more specialized and as legal has followed the medical profession, it’s ever more hard to do that. And so the ability — it’s a real tough thing, when a client, a longstanding client comes through the door and you are a litigator and they say I need help with this real estate lease, it’s a real hard thing to send them down the street to someone else. And we all face those issues unless you work at a firm with 1,000 or more lawyers. The other 99% of the world faces that practical business issue everyday. We have to balance that at all times with the obligation of competency in everything that we do, and this is a way freelance lawyers, wherever they come from, are a way to assist small and medium firms in achieving their ethical obligations and putting out a better product. Christopher Anderson: Yeah and I can also see how that really matches up with people’s expectations. I mean like you, I have been a practicing lawyer for many, many years and whether it be in my office or at social occasions or even in my family, people are like, oh, he is a lawyer, whatever the topic would be, like the craziest stuff; oh, you want to do a patent, talk to Chris. He is a lawyer. Nobody even asks, hey Chris, how many patents have you done? They are just like I graduated law school therefore the entire body of law that has ever occurred was poured into my head and I can command it at will, and the consumers don’t understand that that’s not necessarily true. You mentioned medical, they get it more about medical than about law. They are like, you are a lawyer, tell me about this. And so the way you have explained it is the use of freelance lawyers can actually help us as practicing attorneys to meet consumers’ expectations of what we are actually able to do. Greg Garman: Yeah. I don’t know about you, but I have never sat down on an airplane in which I didn’t find the person next to me seeking a couple of hours of free legal advice, usually it was something I have absolutely no idea what to do with. I read an interesting statistic the other day that in hospitals 90% of the doctors who are reviewing radiology x-rays and the like, those are freelance doctors that are outsourced by hospitals and so we do accept that specialization and we do accept freelancing in other similar professions to ours and I think our time is here. This is a way that we can improve our practice, we can improve our clients’ work product. And we have all heard that the billable hour is dead or dying, no one has been able to figure out what the answer is, and the reason is simple. It cuts into our profit margin everything that we have tried. So that’s the key is finding a way to accomplish all that while at the same time preserving the profit margins so that the best and brightest join our ranks. Christopher Anderson: Yeah. And that makes sense for us and it makes sense for our clients. I mean really it’s helping to align our interests with them, because we are providing them with value instead of time, because really — I always like to tell a joke. There’s only two things that people in the world would rather pay for by the hour, one of them is parking and the other one everybody knows, but other than that, people don’t like to, but it’s what we have figured out or actually what the insurance companies caused us to figure out in turning the billable hour, and I think bringing this outside expertise really helps us to deliver value. I am talking with Greg Garman. He is the Co-Founder and CEO of Lawclerk, that provides freelance legal services to lawyers across the country. We have been talking about what kind of law firms can use it and what things that freelance lawyers can do are. When we come back, we are going to — obviously everybody that’s listening is thinking about, okay, yeah, but what about ethics? What about unauthorized practice of law? So when we come back from the break let’s talk about that. Advertiser: Lawclerk is where attorneys go to hire freelance lawyers. Whether you need a first year to perform legal research or a seasoned attorney to assist with a complicated appellate brief, Lawclerk has hundreds of freelance lawyers with every level of experience and expertise. There are no sign up or monthly fees, only pay the flat fee price you set. Increase your profits, not your overhead. Learn more at HYPERLINK “http://www.lawclerk.legal” www.lawclerk.legal. Advertiser: Ready to create and build your own solo or small firm practice, need a nuts and bolts education on the 360-degree experience of starting a business, there is only one online destination dedicated to helping you achieve your goals, Solo Practice University, the only online educational and professional networking community dedicated to lawyers and law students who want to go into practice for themselves, more than 1,000 classes, 58 faculty and mentors. What are you waiting for? Check out HYPERLINK “http://www.solopracticeuniversity.com/”solopracticeuniversity.com today. Christopher Anderson: Welcome back to The Un-Billable Hour. I am talking with Greg Garman, the Co-Founder and CEO of Lawclerk, and we have been talking about freelance lawyers. We have talked about who they are, what they do and we have talked about what kind of law firms use them. And what I wanted to talk about now because I know our listeners are thinking about it is, is it ethical? I mean have the states spoken, have the Supreme Court spoken, have the Bar Associations said that law firms can do this? What are the considerations? Greg Garman: And the simple answer is yes, subject to appropriate oversight. We as lawyers obviously have ethical obligations to our clients. We have the obvious issues of conflicts, we have the obvious issues of confidentiality, but we do have the issues of oversight and we do have to protect against the unauthorized practice of law that has been set forth in the ABA Model Rules and adopted by every state in some fashion. The key to using freelance lawyers is to ensure that you as the lawyer who has the relationship with the client, you as the lawyer who has to go to court or talk to opposing counsel protects your ethical obligations and the best way to do that is through oversight. We are comfortable and have been comfortable for more than a hundred years using non-lawyers in our businesses as paralegals and using recent lawyers who sometimes are the most dangerous lawyers in the world, who are recent law school graduates. We know how to oversee what they do to comply with our ethical duties. The same rules apply generally speaking to freelance lawyers. The way we at Lawclerk manage to have a nationwide network of freelance lawyers as opposed to ones that are simply in your local community is to ensure that they only act as paraprofessionals essentially at the end of the day. The Lawclerks by agreement, when you use our site, can’t talk to the client, they can’t go to a deposition, they can’t go to court, they can’t call opposing counsel. There are 10 or 11 indicia of the practice of law and those are important. They are important for protecting our profession. They are important for protecting what we as lawyers have promised our clients, and at the end of the day maintaining your ethical obligations is relatively simple if you take care of the same things you would take care of within the office; confidentiality, conflicts and ensuring that you oversee what the freelance lawyers are doing, but you have to tell yourself, at the end of the day I am the one responsible for the work product I am giving to my client and you can’t just abdicate those responsibilities to a freelance lawyer. You have to own the project at the end of the day, but you can ethically get help from freelance lawyers. The first thing we did before we launched Lawclerk was we undertook a 50-state survey, and on our website we have a 100 page white paper on the ethical use of freelance lawyers that anyone can use, whether you use our site or not. The Supreme Court has spoken on it. Every state has spoken on it. It is a commonly accepted practice subject to that oversight. We then spent more than 12,000 development hours building the back end of our site to ensure that all of the ethical obligations that are not only contained in the Model Rules, but each state’s ethical rules are complied with. Christopher Anderson: Yeah. So I mean, I guess it sort of makes sense, right, you can no more abdicate to your paralegal or to your legal secretary than you can to a freelance lawyer. You are delegating and whenever — and this is what I teach when I work with lawyers across the country is delegation is the delegation of authority to get the work done. The responsibility always stays with you, and that’s kind of where you are coming from with this as well. Greg Garman: We like to tell people, imagine that the paralegal you have down the hall went to law school and has 10 years of experience but never sat for the Bar. There’s only so much that they can do other than assist you in providing legal services. Christopher Anderson: Right, that makes total sense. So what I would like to do is like help our listeners — I think they kind of get it now, it’s ethical, everybody is able to do it, and the freelancers, the categories of the freelancers can assist with extra help in the core practice and additional subject matter expertise, but let’s just kind of go a little bit around what kind of projects do you see freelancers being really successful in doing for law firms? Greg Garman: So the things that freelancers are uniquely designed for are things that are repetitive and candidly don’t always require a history with the case. We give basic research memos to first years and paralegals. Freelancers, who are more sophisticated, are able to tackle complex issues of law, complex analysis that may simply not be the type of research that a law student can do. So research, drafting, pleadings for the supervising lawyer are projects that we see all the time. Freelance lawyers are particularly skilled at large document reviews that come in, many of them specialize in that, many of them have gotten good at spotting exactly the issues that the attorneys are looking for and candidly there’s not much that can’t be assisted by a freelance lawyer as long as it’s not going to a deposition, going to court, talking with the client, seeking those factual backgrounds. Christopher Anderson: And we kind of touched on it, but I want to also just kind of elucidate if we can a little bit more about how can law firms, how can solo lawyers or small firm attorneys make more money by using freelance lawyers? Greg Garman: The interesting thing about being a solo practitioner or a small firm lawyer is that we do often have a practice that’s general in nature or fairly broad. They will take litigation of all sorts. They will do some transactional work. Many of us have something that we deem to be our core practice, but our core practices often require transactional documents if you are a litigator, settlement agreements and the like. So at the end of the day the way freelance lawyers can make our practices better is a really, really big promise, and it’s hard to deliver on, but it’s a really big promise and that promise is a better product for our clients that we can produce cheaper, and the way we produce it cheaper is getting rid of the overhead. It used to be that the way we thought of fees and expenses with associates was one-third to cover the associates’ compensation, one-third to go towards overhead and one-third was intended to be the profit margin. Well, if you have unproductive time, if you have write-downs, if you have write-offs, that all comes out of the last third, that all comes out of the profit component. So the ability to get freelance lawyers on-demand only when you need them minimizes not only your expense, it minimizes your risk as a business owner if you have a slower period or you have a client that doesn’t pay. It also allows us to move away from the billable hour. The billable hour is nothing more than a metric for value and we have been talking for two decades or three decades about what we are going to do to replace it and there is no one answer but the ability to capitalize on what’s an unfortunate legal market out there of underemployment. There are a lot of people who are underemployed. We have a lot of attorneys who went to big firms, who grew up in the upper class system who are fabulously technically skilled lawyers, but they didn’t have a million dollar book of business sufficient to be a partner and they have an incredibly narrow but talented skill set that can be put to use. So the ability to produce better work faster at the end of the day is what ultimately will allow us to either have more value in our billable hour or move away from the billable hour to have more of a flat fee based system that does importantly protect the profit margin. Christopher Anderson: That makes total sense. So I think the last thing that comes to my mind is — because I mean it all makes sense, right, finding these people to provide the subject matter expertise or to just fill in on our core competency, either one is great, but if I am looking for a specific subject matter expertise, it doesn’t feel like something that’s going to be that easy to do. How does a marketplace like Lawclerk facilitate matching the lawyers with the freelancers? Greg Garman: So our marketplace is simple. The attorney posts a project, what they need and how much they are willing to pay. Each of our Lawclerks, when they register, identifies the subject areas in which they are interested or which they have experience. So when you post a project and say you need something unusual like a water law project, all the lawclerks, the freelance lawyers who have identified that that’s an area of interest or expertise of theirs, they get an email or a text message. It says this project was posted that meets your interests. This is how much it pays. If you are interested in applying for the job, click here. You as the assigning lawyer, you review the applications, résumés, writing samples, experience and ratings, decide which expert you are going to work with at the end of the day and you move forward. We are not alone in this; Upwork has been doing this for many professions, including legal, for a very long time. Montage Legal is out there. We certainly didn’t invent the gig economy or the use of freelancers, but we did create a marketplace that was specifically tailored towards ethical compliance and specifically tailored towards a project-based market system, which is we think exactly what solo and small firms need. Christopher Anderson: That makes total sense. Greg, thank you so much for being a guest on The Un-Billable Hour. Greg Garman: Thanks so much for having me. Christopher Anderson: You are welcome. That wraps up this edition of The Un-Billable Hour, the Law Business Advisory Podcast. My guest today has been Greg Garman. And Greg, if our listeners want to learn more about Lawclerk or about you, what’s the website they can look at? Greg Garman: It’s HYPERLINK “www.lawclerk.legal” www.lawclerk.legal. Christopher Anderson: HYPERLINK “www.lawclerk.legal” www.lawclerk.legal. And do you have a Twitter or Facebook handles? Greg Garman: We do. We are on Twitter, we are on Facebook and YouTube. Christopher Anderson: And is it just @Lawclerk on Twitter? Christopher Anderson: Okay, @lawclerklegal. And Facebook? Christopher Anderson: Excellent. All right. Well, this is Christopher Anderson. I look forward to seeing you next month with another great guest as we learn more about topics that help us build a law firm business that works for you.